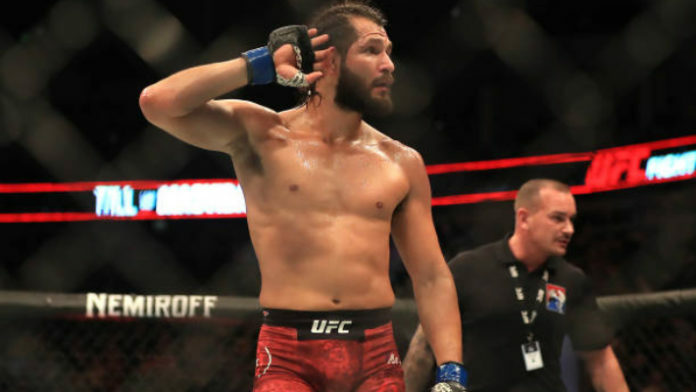 Jorge Masvidal won’t face any punishment from the UFC for the backstage fight that broke out with Leon Edwards after UFC Fight Night from London ended this past Saturday night. The altercation occurred while Masvidal was doing a post-fight interview when Edwards was walking nearby and he shouted something at his fellow welterweight contender. Masvidal answered and then walked over to confront Edwards before throwing a few punches as security and UFC officials rushed into separate the fighters. While a backstage fight is never a good look, UFC president Dana White is much angrier with his own staff than he is with the fighters involved in the near melee. “I do blame my staff. There’s never a scenario where you let guys walk up to each other like that backstage,” White told Yahoo! Sports on Tuesday. “We have enough people backstage that, that shouldn’t happen, including security. I’m super disappointed in my whole crew for that one. These guys are fighters, they’re in the heat of the moment, he just won, he’s got the adrenaline pumping and [Leon Edwards] comes by plus Masvidal is ‘that guy’. White says it was a heated moment and it was definitely unfortunate that it happened but he’s not looking to dish out any sanctions or fines to Masvidal for the post fight brawl. “It’s the fight business. Sometimes people overreact,” White said. “I thought a lot of people overreacted on the Conor [McGregor] and Khabib [Nurmagomedov] thing. We had that thing contained like that, we knew that was a possibility that could happen and we were ready for it. These things happen. White believes that fighters are just a different breed of athlete and these kinds of altercations are going to happen from time to time, like it or not. The key is to ensure that the fighters never get the chance to act on those instincts and that’s why White says the UFC staff failed him in London. “These people that fight for a living are different than normal people. These people function on a whole different level than normal human beings do,” White said.